There are many shoes still to drop at Fukushima Daiichi, said Kevin Kamps, radioactive waste monitor at Beyond Nuclear. If something goes wrong with the radioactive waste storage pools, there could be a release of high-level radioactivity into the air, he added. 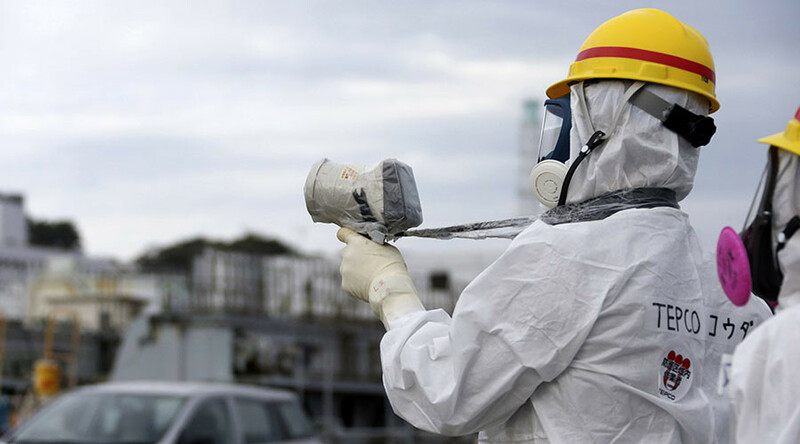 Radiation at Fukushima’s nuclear power plant is at its highest level since the tsunami-triggered meltdown nearly six years ago. Tokyo Electric Power Company (TEPCO) is reporting atmospheric readings inside Daiichi’s reactor No.2 are as high as 530 sieverts an hour, while a human exposed to a single dose of 10 sieverts would die in a couple of weeks. RT: Can you explain what is likely going on here? Kevin Kamps: This catastrophe that is ongoing is nearly six years old at this point. The fuel, the melted cores have been missing an action. TEPCO doesn’t know where they are; the Japanese government doesn’t know where they are; nobody knows where they are. What could have happened is these probes, these cameras, these robots, these radiation monitors that are being sent in by TEPCO to try to figure out what is going on, may have encountered the closest they have come yet to these melted cores. They may even have come upon melted fuel that is not under water, and water serves as a radiation shielding. So if this is an open area and there is no water – that could explain. But what you’ve got are melted reactor cores. Of course, human beings can’t be in operating atomic reactors. They also can’t be in this area where there is a meltdown. There is also imagery – it looks like a melt through of a metal grade. It all stands to reason that the cores melted through the reactor pressure vessels and down into the containment structures right through that metal grating. It is not unexpected, but we still don’t know where the cores are. There are claims that “it’s all contained, don’t worry about it.” It is indisputable that there is a daily flow of radioactively contaminated groundwater into the ocean. The figures something like 80,000 gallons per day of relatively low-level radioactive waste water. Then you’ve got those storage tanks – we’re talking 800,000 tons of highly radioactive water stored in tanks. Every day they pour a hundred tons of water on each of these three melted down cores. Sometimes they lose those tanks. They leak, they overflow – it is an ongoing catastrophe. RT: So the contamination, in this case, could leak out, couldn’t it? KK: There is some leakage on a daily basis. Then they try to capture as much as they can and contain it in the storage tanks, which they sometimes lose, whether during a typhoon or through human error - they have had overflows. So many shoes can still drop at Fukushima Daiichi. One of the ones is the high radioactive waste storage pools that aren’t even inside radiological containment. They don’t have all of that spent nuclear fuel transferred to a safer location in a couple of the units still. If something were to go wrong with that – those would be open air releases of very high-level radioactivity. The prime minister at the time the catastrophe began, [Naoto] Kan, had a contingency plan to evacuate all of North-East Japan – up to 50 million people. It was predominantly because of those storage pools. We’re still in that predicament- if one of those pools were to go up in flames. As Tokyo plans to host the 2020 Olympics and bring in many millions of extra people into this already densely populated area -it is not a good idea. RT: Going back to this specific leak: how does this complicate the cleanup efforts there? Is it possible even to get something in there right now to examine what is going on? KK: State of the art robotic technology – Japan is a leader in robotics – can only last so long, because the electronics get fried by the gamma radiation, and probably neutron radiation that is in there. That is the situation deep in there. They are already saying it will take 40 years to so-called decommission this, but that may be optimistic. RT: Also in December the government said it is going to take twice as much money – nearly twice as much as they originally thought – to decommission that. Does this make matters ever worse – this leak? Or is this just kind of the situation to expect at this point? KK: It just shows how dire the situation is. The figures of $150 billion to decommission – I have seen figures from a think tank in Japan sided by Green Peace Japan up to $600 billion. If you do full cost accounting: where is this high-level radioactive waste going to go? It is going to need a deep geological depository. You have to build that and operate it. That costs a hundred billion or more. So when you do full cost accounting, this catastrophe could cost hundreds of billions of dollars to recover from. We’re just in the beginning.